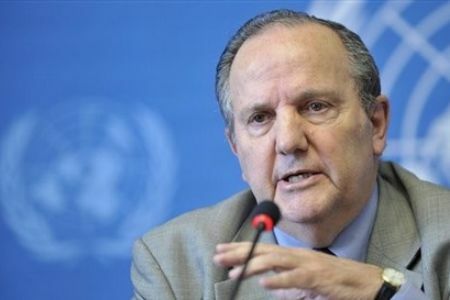 UN Special Rapporteur on Torture Juan E. Méndez has repeatedly requested permission to visit U.S. prisons to report on solitary confinement and other conditions. The United Nations’ top experts on the human rights of people in detention are calling on the United States to open the doors of its prisons to an official visit. Juan E. Méndez, the United Nations Special Rapporteur on Torture, and Seong-Phil Hong, the Chairperson of the Working Group on Arbitrary Detention, made the request after President Obama’s historic visit to Oklahoma’s El Reno prison, part of a series of actions to promote criminal justice reform. “We hope the President’s recent actions will ensure concrete steps are taken to facilitate these visits to US detention facilities, including private interviews with detainees,” said the human rights experts in a July 21 press release. It would be an unprecedented move for the United States to facilitate the requested visit. Méndez has been seeking permission from the U.S. State Department to visit people in solitary confinement for over two years. As UN Special Rapporteur on Torture, it is Méndez’s job to expose torture and monitor progress no matter where it is happening, and in an August 2011 report, he indicated that periods of solitary confinement exceeding 15 days constitutes torture. He has since made solitary confinement a priority, and criticized the United States for its excessive reliance on the practice, though he has yet to conduct an in-person investigation into the issue. His one visit to the Pelican Bay State Prison’s Security Housing Unit in 2014 was arranged outside of typical channels, and he has yet to visit an isolation unit in a federal facility. With current happenings, however, Méndez and Hong are once again pressing for the removal of these barriers to access. In a speech to the NAACP on July 14, the President emphasized the problems of prison overcrowding, racial inequalities in the justice system, and excessive reliance on solitary confinement. In light of this unprecedented commitment to addressing flaws in the criminal justice system, Méndez and Hong expressed hope that they will be given the opportunity to shape reforms that would bring the U.S. in line with international standards. This entry was posted in News and tagged criminal justice reform, Federal Prisons, Human Rights, International Agreements, Juan Mendez, Obama, Solitary Confinement, Torture, U.S. prisons, UN Special Rapporteur on Torture, United Nations. Bookmark the permalink. Love the liberals and all of their “logic”. You’re absolutely right! Drug dealers, gang bangers, burglars, murderers, and the especially scumbag pedophileso deserve WAY better.